On Wednesday lunchtime whilst mooching around the mean city streets of Birmingham looking for a bite to eat, the mundane existence of my working week was suddenly given a swift kick in the b*llocks. 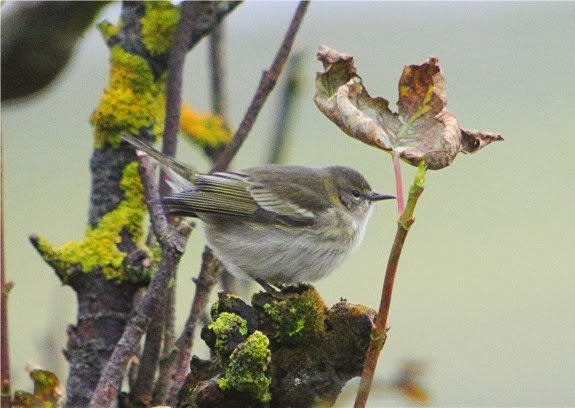 News was received that a presumed CAPE MAY WARBLER had been located on the most northerly outpost of my beloved Great Britain, the Isle of Unst in Shetland. 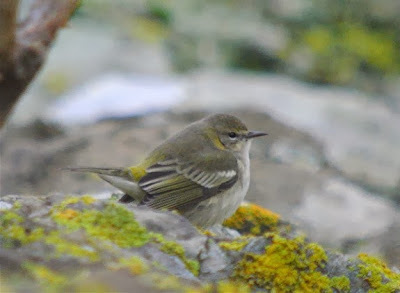 A 'presumed' CAPE MAY WARBLER? My mind raced ahead of itself. Surely not? This was a species of North American warbler that had only reached Europe once before. Perhaps it was 'just' a particularly drab YELLOW-RUMPED WARBLER? There had to be some kind of mistake. Then whilst sat at my desk the identification was confirmed. I was stunned. Fast forward to Friday morning and I somehow found myself heading up the hellish M6 motorway with the Wolftown Cosa Nostra - Steve Allcott, Tony Barter and Jason Oliver. In their company I felt like Henry Hill (played by Ray Liotta) in a f*cked up birding version of the movie 'Goodfellas'. I learned a lot about myself during that long, tortuous journey up to Aberdeen as well as picking up a few other valuable nuggets of knowledge. I discovered the benefits of truck stops over service stations with their huge, cheap breakfasts and Polish hookers. I discovered that Bart was once a professional wrestler called the 'VAT Man' and that shock horror, the whole thing was choreographed and rigged. I also discovered that no matter how tough someone is, they can get all misty eyed and nostalgic when it comes to reminiscing over 1970's children's TV programmes. Anyway back to the bird. About a hour into our journey north we received confirmation that our prize target was still present. We all cheered and willed it to linger for just one more day until we could get up there. A few hours later I then received a most disturbing call from my pal Steve Nuttall who at that time should have been watching the rarity after catching the ferry over to Shetland the previous evening. "How you doing mate?" I asked. "Well not too good actually, haven't you heard?" came his concerning response. At this point my heart sank. The first thought that sprang to mind was the bird had been snaffled by a hungry Merlin or even worse some mangy feral feline. It therefore came as a bit of a selfish relief when I discovered the real reason behind Steve's woes. At around 4.00am some poor soul had decided to jump from the vessel and take their own life. As a result of this tragedy the ferry had to turn back to help search for the body which resulted in Steve and his crew finally hitting Lerwick during lunchtime, a delay of nearly five hours. There was no way they would have time to head all the way up to Unst from Mainland Shetland and be back in Lerwick for the return ferry back to Aberdeen that same day. I tried to reassure him that everything would work out fine. We eventually reached the ferry terminal in Aberdeen ourselves at tea time and met up with the final member of our team, Rob 'Moth Arms' Gilbert who had made his way there by train from Stoke. We settled into the bar onboard MV Hjaltland and tried to relax in the knowledge that Steve had finally connected with the CAPE MAY WARBLER before dusk and that the weather up on Unst had been pretty appalling by the time the bird had gone to roost. Our chances of success tomorrow had definitely increased upon hearing such news. The crossing itself was not too bad at all and by 6.30am we were all tucking into our breakfasts after a decent night of sleep. As dawn broke on Saturday morning we quickly disembarked and Jason jostled for a prime position in the queue for the hire car. The lady in charge of distributing the vehicles amongst the eager twitchers obviously took a dislike to us though. We raced out to the car park to find a diminutive Toyota Aygo awaiting us. The cramped Toyota 'No Go'! As four and a half burly birders plus baggage crammed into a space just a tad bigger than an oil drum I was half expecting to see Norris McWhirter standing kerbside as we tootled out of Lerwick. It had to be some kind of Guinness World Record. The only thing missing was Roy Castle and his trumpet fanfare. After a constricted forty-five minutes or so we finally rolled into the hamlet of Toft for the ferry crossing over to the Isle of Yell. It was nearly nine o'clock and there was still no positive news regarding the CAPE MAY WARBLER. As we sped from the bottom to the very top of Yell for our second brief ferry ride none of us had any phone signal. I knew Steve Nuttall and the lads would be doing their very best to locate the bird but now I had no way of receiving that potentially joyous call from him. The atmosphere in the car became extremely tense and nobody uttered a single word until we reached Belmont. Unfortunately there was no room for us on the first ferry over to Unst and it would be a long, stressful wait for the next. At this point the wind started to increase in force and the rain began to fall. The whole team began to show signs of despondency and they quickly went their separate ways to search for birds. I on the other hand took shelter in the dark, dank waiting room and spent the time starring down at my phone. Suddenly I had a brainwave. Perhaps I could log onto someones WiFi and search the internet for news. Remarkably there was a router nearby where a password was not required. This is Shetland of course, why would anyone need a password? 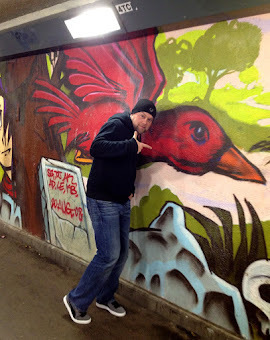 I jammed in and left a desperate plea for news on Birdforum. I then checked the Rare Bird Alert website but there was no news there either. My last hope was Twitter and as I refreshed my Tweets I noticed a message on Bird National. I read it over around three or four times carefully checking the time and date..... the CAPE MAY WARBLER was still bloody present! I burst open the door of the waiting room, raised my eyes to the heavens, held out my arms and hollered at the top of my voice "IT'S STILL THERE!" Embarrassingly there was not a single other birder in sight. I raced down to the only other car of birders in the queue and tapped on their window to give them the happy news. At last I had someone to share the elation with. Eventually the other lads all made their way back to the car one by one and it was broad grins and childish excitement all round. As the ferry rolled into Gutcher we flew out of the harbour and up to Baltasound at pace. We abandoned our tiny vehicle near The Manse and headed across to another of the birds favoured feeding spots, a derelict house with a trio of stunted sycamores enclosed within a small walled garden. There were just eight other birders on site and the news was not good at all. The rarity had not been seen since the initial sighting about two hours earlier. Whilst some staked out the garden in case the bird returned, others including myself started to search the weedy fields and drystone walls nearby. It was agonising. It had taken us a total of 26 hours and we had travelled over 700 miles to reach our destination. We were determined not to leave Shetland empty handed. To 'dip out' was simply not an option. The favoured haunt of the CAPE MAY WARBLER! Baltasound, Isle of Unst, Shetland. As I carefully surveyed an area around some old farm buildings I heard a loud whistle emanating in the distance. I lifted my bins to see Steve Nuttall peering into the garden of a bungalow two fields away waving his arms. Without delay I sprinted over the rough grassland as fast as my legs could carry me. Following in my wake were about twenty other birders trying to keep up. I hurdled a gate and continued down a lane where I finally reached the garden. "It may have flew towards you!" shouted Steve. I lifted my bins to scan the sparse vegetation and suddenly a strange warbler type bird flew right across my line of sight. It had to be the bird. In order to compose myself I took a few deep breaths as one by one other birders arrived at my side. Suddenly it appeared once again perched up on the garden fence. "There it is!" I yelled followed quickly by the inevitable "Where is it?" "Directions please!" "Help meeeeee!" "F*ck!" from everyone else. The CAPE MAY WARBLER twitch! After a tantalisingly brief view, the bird then took flight again and headed further down the lane. Here it fed for around ten minutes in a lone sycamore tree at the side of a garage. As the bird settled down so did the nerves of every twitcher on site. All the trials and tribulations had been well worth it. I was now one of the few privileged birders in Britain to spend a few precious moments with a CAPE MAY WARBER in his own beloved country. Yes, our journey had been a long, drawn out stressful affair but spare a thought for this tiny bundle of feathers that had made an arduous journey of over 2,500 miles across the Atlantic Ocean. It really is one of the wonders of the natural world how birds like this migrate and how they survive such ordeals. The bird continued to be very mobile and after a few brief views in various locations it finally flew off towards an old churchyard and promptly disappeared. Jase Oliver watches in awe! With the pressure off and after much hand shaking and back slapping we slowly made our way back to the spooky house in the hope that the bird would return there at some point. As we approached the walled garden it appeared that lady luck was well and truly on our side. There it was again, a splendid first winter female CAPE MAY WARBLER gleaning insects from the underside of the sycamore leaves just a few yards away. For the next hour or so the bird provided us all with tremendous views in the trees and as it hopped around picking through the leaf litter. It was even heard to call on a number of occasions, a sharp, high pitched 'zipp'. It seemed to call only when it became agitated by another bird intruding on its patch though such as a European Robin or a Shetland Wren, both of which were promptly chased off. 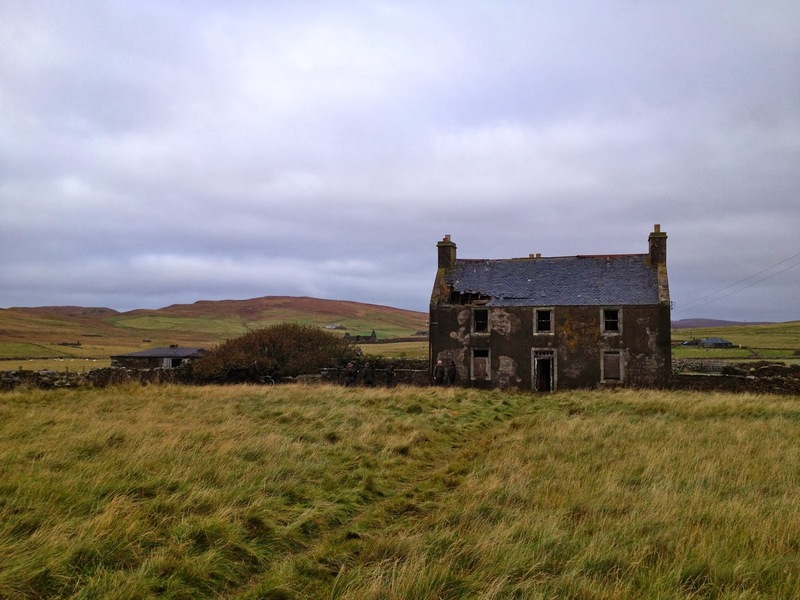 For no particular reason the bird then took flight once more and headed over towards The Manse, an imposing old house with a single sycamore growing in the corner of a bare, desolate garden. Here it started throwing its weight around once more as it turfed out two male Blackcaps before continuing its feeding routine. With the car nearby I decided to grab my scope to see if I could rattle off a few digi-scoped photographs. After asking Jase for the car keys I soon sensed a degree of panic in his demeanour. His usual ruddy complexion quickly transformed into that of a pale-faced geisha girl. He continued to pat himself down as if his body had suddenly caught fire. He had only lost the f*cking keys! What the hell were we going to do? There would be no way that the car hire company could get a spare set up to us in time for our ferry back to Aberdeen. We considered abandoning the car on Unst and catching a lift back to Lerwick but nobody had space for one extra birder never mind five. We tried to remain calm and split up to search the five square miles of muddy tracks, grassy fields, overgrown ditches and derelict buildings we had all been hiking around. 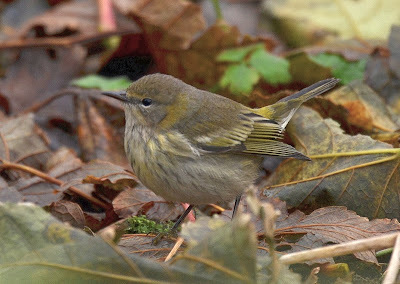 There was more chance of a RUBY-CROWNED KINGLET appearing on this side of the Atlantic than those keys being found. I attempted to apply a degree of logic to the situation. I played back the scene over and over again in my mind when the bird was initially located. I remember Jase jogging along the fence line of the bungalow when I initially picked up the bird in the garden. There was a good chance that the keys had been jarred from his coat pocket at this point. I made my way over to the area and within a minute I spotted a tiny white triangle poking out from the long grass. Finding those car keys was undoubtedly the second miracle of the day. We returned back to The Manse for one more fix of the rarity before fleeing the scene. Once again it performed like a star, even hopping out onto the wall at one stage in order to indulge in a spot of fly-catching. Before heading south we called in at Halligarth in Baltasound where we saw and heard several Siberian Chiffchaff. A female Merlin also dropped in for a few moments and a winter plumaged Slavonian Grebe was picked up by Steve feeding on a small loch nearby. Other birds of note included a fly over Common Crossbill and a single Common Redpoll. Upon arriving back on the Mainland we headed out west to the small fishing village of Walls. Here we found a very pleasant lady tending her flower beds in a garden which contained a rarity from a more easterly direction. 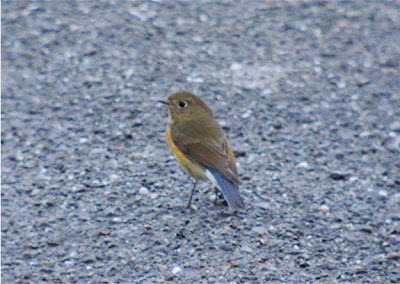 The kind madam beckoned us onto her property and within a few minutes we were all enjoying point blank views of a stunning RED-FLANKED BLUETAIL, my fifth in Britain. Although quite mobile at first the bird eventually decided to feed out in the middle of the road reminiscent of a Pied Wagtail. Only dream scenarios like these can happen on Shetland. The atmosphere throughout the ferry back to Aberdeen that evening was full of joy and merriment. All birders onboard were over the moon on how the day had panned out, even those like Steve Nuttall and Kev Clements who were making their way home a full day later than anticipated. It was time to neck a few drinks in the bar and then retire to our secret drinkers corner where many plastic cups of single malt whisky were raised in celebration. It was then time to head to the lounge and find a quiet place on the floor to rest my weary head for the evening. According to the weather forecasts we were in for a choppy overnight sailing. Tony 'VAT Man' Barter & Jason 'No Keys' Oliver celebrate! Following an evening of disturbed sleep due to the sound of crashing waves and twisting metal I did not feel too great when I eventually woke. As we disembarked the ferry and made our way through the torrential rain to the car I felt as though I was still being tossed from side to side. I was not looking forward to the long car journey ahead at all. As we made our way south though the weather started to improve. 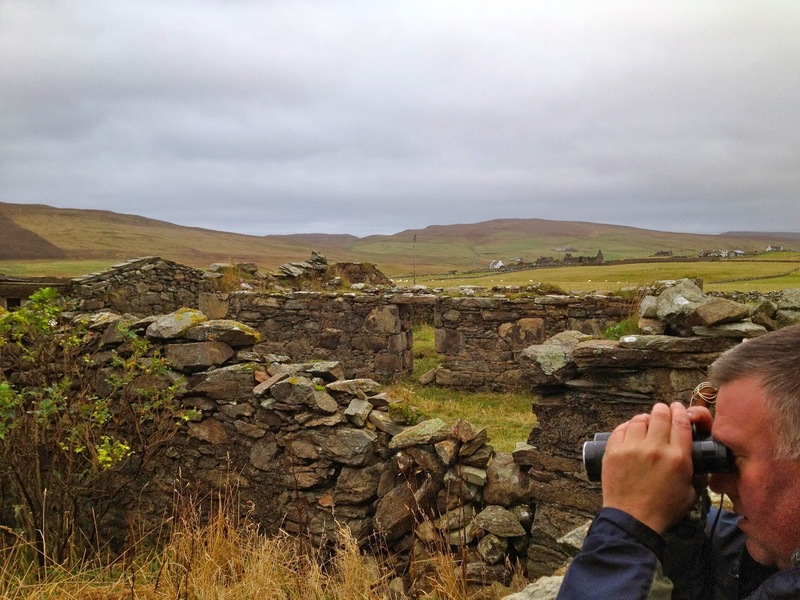 It was then decided that we would make a detour over to St Abb's Head where an adult male SARDINIAN WARBLER had been in residence for a number of months. This was the first time I had visited this beautiful location and I was well impressed. Unfortunately though, despite a thorough search of the area north of the loch we failed in our efforts to locate the Mediterranean rarity. The only birds of note were 23 Pink-footed Geese passing over, 2 Siskin and 3 Bullfinch. With a tremendous looking stormy front moving in over the Atlantic from the south-west, the conversation during the journey back was filled with birding predictions for the following week. None of us however managed to predict what would hit Ireland that afternoon. Amazingly a RUBY-CROWNED KINGLET had been trapped on Cape Clear Island. Just like the CAPE MAY WARBLER we had seen the day before this was only the second ever sighting of this North American species in Europe. One thing was certain, the south west of England was sure to provide us with something tasty over the coming days. I felt another trip to the Isles of Scilly would be inevitable for the following weekend. Finally at around 7.00pm on Sunday evening I arrived back home in North Warwickshire. I was absolutely shattered and even twelve hours after staggering of that boat, I still felt as though I was at sea. Despite the mild exhaustion and the proverbial roller coaster ride of the past few days though I can honestly say I had loved every single second of it. The higher the risk, the better the reward. What an adventure! Fantastic account of your adventure Archie,felt as if I was there with you.Some real immotions going on there, with the lost keys,person overboard etc. Cheers Paul... believe me it was emotional! FAILED twitcher... whatever one of them is Rich!